Families with a child on the autism spectrum face challenges to participating in physical activity in the community. Yet, little research has examined these families’ experiences and perspectives on such participation. This phenomenological study used semistructured interviews to collect data from 13 families with a child on the autism spectrum to understand their experiences as a family attempting to access physical activity opportunities. Families discussed four overall themes related to participating in physical activity in the community: (1) safety outside the home, (2) lack of acceptance, (3) behavior affecting the family participation, (4) and limited opportunity for activity. Evidence suggests that physical activity can provide tremendous opportunities to build better connections within the community and improve quality of life, but the barriers discussed by parents in the present study suggest that families and their children on the autism spectrum might not yet have the same opportunities for access or support. AJB led the design and execution of the present study, as well as performed the initial data analysis; she collaborated in writing the paper and editing the final manuscript. AMCD collaborated in the design and analysis of the study; he collaborated in the writing of the paper and editing the final manuscript. Chico, California State University provided the IRB approval for the study; this study has been performed in accordance with these ethical standards. All participants gave their informed consent prior to their inclusion in the study. Bremer, E., Crozier, M., & Lloyd, M. (2016). A systematic review of the behavioural outcomes following exercise interventions for children and youth with autism spectrum disorder. Autism, 1–17. https://doi.org/10.1177/1362361315616002. Buchanan, A. M., Miedema, B., & Frey, G. C. (2017). Parents’ perspectives of physical activity in their adult children with autism spectrum disorder: a social-ecological approach. Adapted Physical Activity Quarterly, 34(4), 401–420. https://doi.org/10.1123/apaq.2016-0099. Colombo–Dougovito, A. M. (2017). A mixed–methods analysis of a fundamental motor skill intervention for children with autism spectrum disorder (unpublished doctoral dissertation). University of Virginia, Charlottesville, VA, USA. https://doi.org/10.18130/V3HW66. Galpin, J., Varratt, P., Ashcroft, E., Greathead, S., Kenny, L., & Pellicano, E. (2017). The dots just don't join up': understanding the support needs of families of children on the autism spectrum. Autism. https://doi.org/10.1177/1362361316687989. Giallo, R., Wood, C. E., Jellett, R., & Porter, R. (2011). Fatigue, wellbeing and parental self-efficacy in mothers of children with an autism spectrum disorder. Autism, 17, 465–482. https://doi.org/10.1177/1362361311416830. Governor’s Budget Summary. (2016). Demographic outlook. Retrieved from http://www.ebudget.ca.gov/2015-16/pdf/BudgetSummary/DemographicInformation.pdf. Haegele, J. A., Lee, J., & Chang, S. H. (2017). Physical activity of parents of children with autism spectrum disorder. International Journal of Disability, Development and Education, 1–10. https://doi.org/10.1080/1034912X.2016.1232375. Healy, S., Nacario, A., Braithwaite, R. E., & Hopper, C. (2018). The effect of physical activity interventions on youth with autism spectrum disorder: a meta-analysis. Autism Research, 4(2), 129–116. https://doi.org/10.1002/aur.1955. Joseph, R. P., Daniel, C. L., Thind, H., Benitez, T. J., & Pekmezi, D. (2014). Applying psychological theories to promote long-term maintenance of health behaviors. American Journal of Lifestyle Medicine. https://doi.org/10.1177/1559827614554594. Little, L. M., Ausderau, K., Sideris, J., & Baranek, G. T. (2015). Activity participation and sensory features among children with autism spectrum disorders. Journal of Autism and Developmental Disorders, 45(9), 2981–2990. https://doi.org/10.1007/s10803-015-2460-3. National Professional Development Center for Autism Spectrum Disorder. (2015). What are evidence–based practices? Retrieved from http://autismpdc.fpg.unc.edu/evidence-based-practices. Obrusnikova, I., & Miccinello, D. L. (2012). Parent perceptions of factors influencing after–school physical activity of children with autism spectrum disorders. Adapted Physical Activity Quarterly, 29, 63–80. https://doi.org/10.1123/apaq.29.1.63. Stacey, T.-L., Froude, E. H., Trollor, J., & Foley, K.-R. (2018). Leisure participation and satisfaction in autistic adults and neurotypical adults. Autism, 116(1). https://doi.org/10.1177/1362361318791275. Travers, B. G., Bigler, E. D., Duffield, T. C., Prigge, M. D., Froehlich, A. L., Lange, N., Alexander, A., & Lainhart, J. E. (2016). 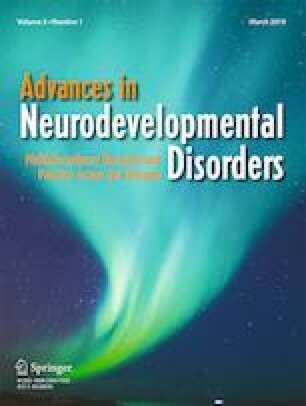 Longitudinal development of manual motor ability in autism spectrum disorder from childhood to mid–adulthood relates to adaptive daily living skills. Developmental Science. https://doi.org/10.1111/desc.12401. Ullrich–French, S., McDonough, M. H., & Smith, A. L. (2012). Social connection and psychological outcomes in a physical activity–based youth development setting. Research Quarterly for Exercise and Sport, 83(3), 431–441. https://doi.org/10.1080/02701367.2012.10599878.